Alawite civilians in Latakia faced the prospect of being massacred if rebels had been able to capture the city, due to the virulently anti-Alawite views of Nusra Front members. Nusra religious clerics draw on the writings of the fringe 14th century Islamic scholar Ibn Taymiyya to argue that Alawites are “infidels” deserving of death. Syria analyst Sam Heller described Nusra clerics as promoting “toxic — even genocidal — sectarianism.” Rebels from the FSA, which have fought alongside and “in the ranks” of the Nusra Front throughout the conflict, also posed a threat to Alawite civilians in Latakia. While typically considered moderate in the Western press, many FSA battalions have been armed and funded by the Syrian Muslim Brotherhood (MB). Thanks to the influence of Brotherhood ideologue Said Hawwa, the Syrian Brotherhood strongly promoted the anti-Alawite sectarian views of Ibn Taymiyya from the 1960’s until the 1980’s. This anti-Alawite sectarianism re-emerged in segments of the Syrian opposition, including in elements of the FSA, when peaceful protests and armed insurrection against the Syrian government simultaneously erupted in Syria in the spring of 2011. Because the US was bombing ISIS in defense of its Kurdish allies in Northeastern Syria and its Iraqi government allies in Northwestern Iraq, the fact that US planners at the same time welcomed the ISIS push on Damascus against the Syrian government was largely obscured. It is also clear that US planners were deliberately supporting al-Qaeda (Nusra), despite its genocidal intentions towards Syria’s Alawites, by flooding Syria with weapons. Because FSA brigades that received funding and weapons from the US and its Gulf Allies were fighting side by side with militants from Nusra throughout the country, in practice much of the money and weapons sent to the FSA ultimately benefited al-Qaeda. For example, US-made TOW anti-tank missiles sent by US planners to FSA groups in Idlib played a crucial role in helping Nusra conquer the entire province in the spring of 2015. Syria analyst Hassan Hassan observed in Foreign Policy during this period that “The Syrian rebels are on a roll” and that “The recent offensives in Idlib have been strikingly swift — thanks in large part to suicide bombers and American anti-tank TOW missiles,” which the FSA and Nusra deployed in tandem. Syria analyst Charles Lister, also writing in Foreign Policy, described how US planners explicitly encouraged the FSA groups they were arming to fight alongside Nusra in Idlib. Rebel victories in Idlib, in particular the town of Jisr al-Shughour, allowed Nusra and the FSA to then threaten the massacre of Alawites in Latakia. When Russia intervened militarily in Syria in October 2015, US planners responded by immediately increasing shipments of TOW anti-tank missiles to FSA groups, some of which then helped Nusra capture the strategic town of Murek in central Syria one month later in November 2015. US planners welcomed rebel gains in Syria, including by rebel groups advocating genocide against Syria’s Alawite population, such as ISIS and Nusra, because these gains bolstered the broader US goal of toppling the Syrian government, in an effort to weaken its close allies, Iran and Hezbollah. US planners wished to see rebel gains in Syria, in spite of the obviously catastrophic consequences for Syrian civilians, including for Syria’s Sunnis, which rebel success would bring. US support for the rebels belies the myth of US “inaction” in Syria, and the myth that any US intervention would be for the sake of preventing massacres and even genocide, rather than in support of it. In the remainder of this essay, I will review the US support for rebel advances in the spring and summer of 2015 in Idlib, Latakia, Palmyra, Yarmouk, and Homs. I will describe how these rebel advances nearly led to the massacre of Syrian civilians in two of the country’s main population centers, Latakia and Damascus, if not for the Russian intervention which halted the rebel advance. In March of 2015, rebels from the Jaish al-Fatah coalition, which included Nusra and the jihadist rebel group Ahrar al-Sham, launched a coordinated assault along with brigades from the FSA on Idlib province, leading to the capture of the province as a whole from Syrian government forces two months later. Rebels captured Idlib city itself on March 29. Al-Jazeera quoted the pro-opposition Syrian Observatory for Human Rights (SOHR) as declaring “Al-Nusra Front and its allies have captured all of Idlib,” in a battle that led to some 130 deaths. Al-Jazeera also quoted representatives of the Western-backed Syrian National Council (SNC) as declaring the capture of Idlib city as “an important victory on the road to the full liberation of Syrian soil from the Assad regime and its allies,” showing the close relationship between the US-supported Syrian political opposition in exile and al-Qaeda affiliated militants on the ground in Syria. Rebels captured the last major Syrian army base in the province on March 19 near the town of Mastouma. Rebel control of Idlib was completed with the ouster of the Syrian army from the town of Ariha at the end of May, causing government forces to retreat to bases on the coast in Latakia. Lister, who has testified several times before the US House Foreign Affairs Committee to make policy proscriptions for US planners in Syria, argued at that time that US cooperation with al-Qaeda (Nusra) is the best option: “[T]here still remains no better alternative to cooperating with al Qaeda, and thus facilitating its prominence. If the West wants a better solution, it must broaden and intensify its engagement with Syria’s insurgent groups and considerably expand its provision of assistance to a wider set of acceptable groups” echoing a popular view among Western and Gulf think tank analysts that al-Qaeda was worthy of US support. Though the city fell on April 25, hundreds of Syrian army soldiers and some women and children fled to the National Hospital complex, which remained under siege by rebels for the next month. The soldiers managed to repel multiple suicide car bombs, targeting them with rocket propelled grenades. Rebels then began preparing to detonate a large tunnel bomb below the hospital to destroy it and kill the soldiers inside. The soldiers then attempted to flee the hospital under air cover from the Syrian air force. Of this incident, the Telegraph reports, “Syrian rebel leaders have described massacres of hundreds of Assad troops and fighters in grim detail as the regime’s defenses begin to crumble in the face of revived attacks on several fronts. President Bashar al-Assad had promised to rescue hundreds of his men who were surrounded in a last stand at a hospital in the key north-western town of Jisr al-Shughour. Eventually, the men tried to run for it under the cover of a regime aerial attack, pre-empting a final assault by rebels including Jabhat al-Nusra, the Syrian branch of al-Qaeda, and other Islamist groups. Instead, many of the soldiers were shot down as they were cornered in orchards on the edge of town, a rebel spokesman said.” Rebels claimed to have killed 208 Syrian soldiers, including several high ranking officers, while pro-government sources claimed up to 80 soldiers managed to escape. One soldier who managed to escape alive described the ordeal to Chinese state media, adding that a number of civilians escaped with the soldiers. Alawites, which comprised some 50% of the population in Latakia, faced the prospect of being massacred if rebels from Nusra had been able to capture the city, due to the virulently anti-Alawite views of Nusra members, who draw on the writings of the fringe 14th century Islamic scholar Ibn Taymiyya in order to deem Alawites “infidels” deserving of death. But it was not only jihadist fighters from the Nusra Front that held strongly sectarian, anti-Alawite views, but also many fighters from the FSA as well, due to the Syrian Muslim Brotherhood (MB) roots of many FSA battalions. Thanks to the influence of Brotherhood ideologue Said Hawwa, the Syrian MB promoted the anti-Alawite sectarian views of Ibn Taymiyya from the 1960’s until the 1980’s. This view helped inspire some Brotherhood members, such as Marwan Hadid, to split from the broader Syrian MB organization and initiate an armed insurrection against the Syrian government in Hama in 1964. Upon Hadid’s death in government custody in 1976, his followers, known as the Fighting Vanguard, initiated an assassination campaign targeting Alawite members of the Syrian government bureaucracy and security forces. As part of this campaign, Fighting Vanguard militants massacred 83 Alawite army cadets in Aleppo in June 1979, while attempting to assassinate President Hafez al-Assad himself in June 1980. In response, Assad ordered the massacre of some 500 MB members then being held in Tadmur prison. The Syrian MB joined the Fighting Vanguard in launching an armed insurrection (which they called a jihad) against the Syrian government in Hama in 1982. Islamist militants attacked police stations, Ba’ath party offices and Syrian army units, forcing the army to withdraw from the city. The army regrouped however, and (in)famously suppressed the insurrection, with the use of considerable violence, leaving thousands dead and much of the city in ruins (for a review of this period, see “Ashes of Hama” by Rafael Lefevre and “The Struggle for Power in Syria” by Nikolaos van Dam). While the Syrian MB has espoused more moderate positions after the group was defeated in Hama, anti-Alawite sectarianism which colored its conflict with the Syrian government in the 1980’s re-emerged in some segments of the Syrian opposition at the outset of anti-government protests in 2011, and was taken up by some FSA rebel groups. FSA groups inquired of Islamic scholars in March 2012 whether it was allowed to raid Alawite villages and kill their women and children in response to alleged crimes committed by the Syrian army. Similarly, in September 2013, Zahran Alloush, a Salafi preacher and founder of the Saudi-supported opposition rebel group Jaish al-Islam, called for “cleansing Damascus” of all Alawites, while calling Shiite Muslims, of which Alawites are considered an offshoot, “unclean” and threating to “destroy your skulls” and “make you taste the worst torture in life before Allah makes you taste the worst torture on judgment day.” Proof that Jaish al-Islam was welcomed by the mainstream and Western-backed political opposition became clear when Zahran’s cousin and co-founder of Jaish al-Islam, Mohammad Alloush, was appointed as the lead negotiator for the Syrian opposition at the Geneva peace negotiations in January 2016. In August 2013, one month after Ayrout’s threats against Alawites, fighters under the command of FSA head Salim Idriss participated alongside Nusra and ISIS in the massacre and kidnapping of Alawite civilians in 10 villages in Latakia, according to the BBC. Human Rights Watch (HRC) investigated the massacre further, and reported that on August 4, rebels overran a Syrian army position, killing some 30 Syrian soldiers. Rebels then massacred 190 civilians, including 57 women and 18 children and 14 elderly men. Rebels also kidnapped and held hostage some 200 additional civilians, the majority women and children. Many of the hostages were released 9 months later as part of a ceasefire deal to end fighting between the Syrian army and rebels in Homs, and victims were able to recount horrific details of their captivity to the pro-Syrian government Lebanese newspaper, al-Akhbar. In November 2015, Jaish al-Islam placed Alawite prisoners, both kidnapped civilians and captured Syrian soldiers, in metal cages in public squares. The Telegraph cited SOHR reporting that “Jaish al-Islam is using these captives and kidnapped people – including whole families – as human shields,” allegedly in an effort to prevent Syrian government bombing. Christians in Latakia also feared the rebels. In March 2014, the Armenian Christian village of Kassab in northern Latakia province was overrun by rebels crossing the Syrian border from Turkey. Saudi owned al-Arabia reports that “Kassab’s residents fled after rebels seized their village on March 23, as part of a rebel offensive in the coastal Syrian province of Latakia, Assad’s ancestral heartland.” One resident who fled when the rebels came told al-Jazeera that “There was no obvious reason to invade, no heavy Syrian military presence. . . But that morning, shelling was pouring down like hail.” Once the residents fled, rebels looted their homes and farm equipment. “They have taken the televisions, radios and microwaves to Kassab Square, and they’ve gathered all the tractors at the Kassab Tourist Resort,” a media representative for the Armenians in the town told al-Jazeera. The Washington Post reported that a “mother of three said that after she arrived in Latakia with her children, she called home, and a man who identified himself as a member of Jabhat al-Nusra answered” and told her “Come back, why did you leave your home? We have come here to protect you,” before also telling her “she should convert to Islam before returning.” The mother described how “I pleaded with him, ‘Eat and drink whatever you like, but please don’t destroy the house.’” American celebrity personality Kim Kardashian, herself Armenian, attempted to bring attention to the plight of Kassab’s residents and the danger they faced from al-Qaeda rebels. In response, the Daily Beast published an article making light of her concerns, suggesting Kardashian was simply an apologist for dictators. Despite rebel attacks on various villages in Latakia province as described above, Latakia city and its some 400,000 residents had largely been spared the violence engulfing much of the country, with some 200,000 displaced persons finding refuge in Latakia, many of whom were housed in tents and pre-fabricated homes in the city’s sports stadium complex. The phrase “catastrophic success” is an odd one. Presumably, the rebel takeover of Latakia and possible collapse of the Syrian government would be catastrophic, given the large numbers of people that would have been massacred. Such an outcome would have nevertheless constituted a success, from the perspective of US planners, as the fall of the Syrian government was long a strategic US goal, due to the desire to weaken Syria’s close allies, Iran and Hezbollah. In late March 2015, ISIS fighters moved south and west from their stronghold in Raqqa to initiate an offensive to take control of territory in central Syria, in Homs and Hama provinces. Both provinces are strategically important as the M5 highway, which connects Damascus to the major population centers in the north, in particular Aleppo, runs directly through both Homs and Hama and constitutes Syria’s economic and military lifeline. ISIS gains in Homs and Hama, in particular in the ancient city of Palmyra, also helped open the road toward Damascus. On March 30, 2015 ISIS fighters assaulted the town of Mabouja, 30 km west of Sheikh Hilal. Al-Jazeera cites the SOHR as reporting that “ISIL [ISIS] had killed entire families and that the dead included people who were burned alive. The population of Mabouja includes Alawites and Ismailis — sects deemed heretical by the radical brand of Sunni Islam espoused by ISIL [ISIS], said Rami Abdulrahman, who runs the Observatory. But he said that Sunni residents were among the dead, too [emphasis mine].” Al-Jazeera also observed that, “ISIL [ISIS] fighters have mounted numerous attacks in government-held areas in the provinces of Hama and Homs in recent weeks, even as it has lost ground in the north and northeast under pressure from a Kurdish militia backed by U.S.-led airstrikes.” The New York Times reports that according to a journalist from the area near Mabouja, “48 bodies had been buried on Wednesday, and that residents were angry that the government had not sent ‘real army, tanks and heavy weapons’ to back up lightly armed pro-government militias” from the National Defense Forces (NDF) which had been tasked with protecting the town. According to pro-Syrian government al-Masdar News, fighters from the NDF were able to finally repel the ISIS assault with help from the “Syrian Arab Air Force’s (SAAF) Hind Helicopters,” while the “NDF was successful in retaking all lost territory in Al-Maba’ouji, while also killing over 40 enemy combatants from ISIS, including a number of foreigners from Tunisia, Chechnya, Saudi Arabia, Kuwait, and Bosnia,” while the NDF suffered 31 dead and 23 injured. US planners could have indeed bombed convoys of ISIS fighters moving across the open desert from Raqqa to assault Palmyra, but chose not to. The LA Times reported of this period that “as Islamic State [ISIS] closed in on Palmyra, the U.S.-led aerial coalition that has been pummeling Islamic State in Syria for the past 18 months took no action to prevent the extremists’ advance toward the historic town — which, until then, had remained in the hands of the sorely overstretched Syrian security forces. The U.S. approach in Palmyra contrasted dramatically with the very proactive U.S. bombardment of Kobani during 2014-15 on behalf of U.S.-allied Kurdish militias fending off a furious Islamic State offensive [Emphasis mine].” US planners were willing to come to the aid of their Kurdish allies in northeastern Syria against ISIS, but refused to do the same for residents in Palmyra, as the city had been under Syrian government control. One year later, in March 2016, Russian and Syrian forces were able to retake Palmyra and liberate it from ISIS, to the displeasure of US planners. The LA Times noted that White House officials have “difficulty publicly lauding advances against Islamic State by Assad and his allies, including the Russians and Iranians, after years of calling for Assad’s fall” and that the Russian success in combating ISIS created a “dilemma” for US planners, because “Washington has endeavored to portray the battle against Islamic State as a project of the United States and its allies, while accusing Moscow of attacking ‘moderate’ rebels instead of the extremists. Palmyra seems to embody an alternative narrative.” US dissatisfaction at the defeat of ISIS in Palmyra was also expressed by State Department spokesperson Mark Toner at a press briefing in March 2016, when Toner refused “to laud” the Syrian and Russian effort to liberate the city. On August 6, 2015 ISIS advanced further toward the Damascus by capturing the town of al-Qaryatain, which lays roughly half way between Palmyra and the Syrian capital. United Press International (UPI) reports that “37 pro-government forces were killed, as were 23 IS militants. The battle began with suicide bombings at checkpoints of the town of about 40,000; the population of the community, a mix of Sunni Muslims and Christians, has been reduced by the flight of refugees. The capture of al-Qaryatain indicates IS [ISIS] can move troops and supplies across central Syria without interference, from Palmyra in the east and southwestward to al-Qaryatain.” CNN cited SOHR as reporting that “The Islamic extremists [ISIS] have abducted more than 200 people, said Rami Abdurrahman, the observatory’s executive director. Up to 500 people are unaccounted for, but Abdurrahman said the observatory has confirmed that at least 230 people have been taken hostage. He said that ISIS militants targeted Christians, some of whom were abducted from the town’s Dar Alyan monastery, as well as people believed to have alliances with the Syrian regime.” To be considered a collaborator or as having “alliances with the regime” by ISIS, it was often enough to simply have a picture of Bashar al-Assad on one’s phone, despite the fact that “lots of people have a picture of Bashar on the phone because it helps them get through checkpoints,” according to one former ISIS captive. ISIS militants then bulldozed the 1,500 year old monastery and its church, while the senior priest, Father Jacques Mouraud, was among the kidnapped. By April 2015, ISIS and Nusra had also captured the Yarmouk Palestinian refugee camp, known as the capital of the Palestinian diaspora, in the southern suburbs of Damascus, and just kilometers from the presidential palace. This allowed ISIS and Nusra to control territory that could be used as a base to assault the heart of the Syrian capital itself. Flush with newly delivered weapons supplied by the CIA and its Saudi partners, rebels from the FSA and Nusra had invaded and occupied Yarmouk camp two and a half years previously, on December 15, 2012. Rebels entered the camp against the will of Yarmouk’s resident’s, despite explicit requests from the PLO that the rebels not invade, as Palestinians wished to remain neutral in the conflict. Some 800,000 Yarmouk residents, both Palestinian and Syrian, fled the camp to escape the dangers of the subsequent fighting. Residents, fearing both the rebel mortars and Syrian government MiG airstrikes, sought refuge in other Damascus neighborhoods, in the Palestinian camps in Lebanon, in Turkey, and even in Europe, with the scale of the displacement numerically rivaling that of the 1948 Nakba. Rebels soon began looting homes, taking over hospitals and stealing medicine. The Syrian government imposed a siege on Yarmouk, which prevented the rebels from advancing further toward Damascus, but which made food, water, and basic necessities scarce, forcing residents to depend heavily on intermittent UNRWA humanitarian aid deliveries. Government and rebel use of heavy artillery and mortars while fighting one another led to significant destruction in the camp, and scores of civilian deaths. The few remaining civilians, roughly 20,000, became trapped in the camp because, as one Yarmouk resident told the Guardian, “rebel groups were eager to keep people in the camp, she said, particularly men and boys. Their departure was seen as defection from the opposition cause as well as potentially making it easier for government troops to enter the camp by force and regain control.” While the Syrian government encouraged civilians to leave, many nonetheless feared being detained by the Syrian security forces which were screening exiting civilians for fighters. The rebel occupation and government siege continued for years, causing hundreds of deaths due to starvation and lack of medical care. The Syrian government tightened the siege, reaffirming their concern that ISIS fighters controlled territory so near the heart of the Syrian capital. Al-Jazeera reporter Stefanie Dekker explained that “It is a complex situation. The government forces control the northern part [of the camp] towards Damascus. It is their priority to keep the capital safe. . . The fact that ISIL [ISIS] fighters are less than 10km away is of a huge concern. If they allow a humanitarian corridor, who will be coming out?” Despite these concerns, al-Jazeera reported that the Syrian government did indeed allow residents to leave, as some 2,000 were able to be evacuated at this time, with many finding shelter in government schools in neighboring areas. As a result of this threat, 14 Palestinian factions agreed to form a joint operations room with the Syrian army to try defeat ISIS militarily and purge its militants from the camp. PLO Executive Committee member Ahmed Majdalani told a press conference that “The decision will be jointly made by the two sides to retake the camp from the obscurantist terrorists who seize it now.” However, the PLO soon reversed course, claiming the Palestinians should not be dragged into any conflict, allegedly as a result of pressure on Palestinian President Mahmoud Abbas from Saudi Arabia and Qatar. The US preference for the advance of ISIS toward Damascus, even as US warplanes were bombing the terror group in Eastern Syria and Iraq, was explained by Secretary of State John Kerry. Kerry shockingly admitted that US planners actually welcomed the ISIS push toward Damascus, which they felt they could leverage to put pressure on Assad to give up power to the US-backed opposition. As discussed above, Kerry explained that, “We were watching. We saw that Daesh [ISIS]was growing in strength. And we thought Assad was threatened. We thought we could manage that Assad might then negotiate. Instead of negotiating, he got Putin to support him.” The New York Times reported in detail on the meeting, an audio recording of which was leaked, as did the Guardian and CNN. Despite Kerry’s shocking comments, none of these three news outlets mentioned his admission that US planners welcomed the ISIS advance on Damascus, presumably due to requests by US intelligence officials. CNN initially posted the full audio of the leaked tape, but later took it down, claiming in an editor’s note to have done so for the safety of participants in the meeting. US planners responded to Russian efforts to save Damascus and Latakia from Nusra and ISIS respectively by immediately increasing shipments of TOW anti-tank missiles to the FSA, despite their knowledge these weapons had helped Nusra conquer Idlib and threaten Latakia. Opposition supporters, including many oddly identifying as socialists, complained bitterly that US planners were not willing to take the step of providing anti-aircraft missiles to the FSA, for the ultimate benefit of al-Qaeda. Author and opposition supporter Leila al-Shami bizarrely suggested the US refusal to provide anti-aircraft missiles to the rebels proves that “The United States support for Free Syrian Army militias on the ground has never really been any more than rhetoric. It’s never really given any serious support to them.” Al-Shami ignores the over $1 billion of weaponry and assistance provided by the CIA to the rebels directly, not to mention the much larger amounts of aid provided by America’s Gulf partners to both the FSA and Salafi rebel groups Ahrar al-Sham and Jaish al-Islam since the start of the Syrian conflict, with US approval. Some opposition supporters expressed to Secretary of State Kerry that they would not be satisfied unless the US military intervened directly on behalf of the rebels to depose Assad, despite the illegality of doing so under international law, and potential that such an intervention could trigger a direct conflict between the US and Russia. Rebel-affiliated media activists tweeting under the guise of the young girl, Bana al-Abed, suggested the US should come to the aid of the al-Qaeda-dominated rebels in Aleppo even at the risk of starting World War III with Russia. US planners welcomed rebel gains in Syria, including by jihadist groups advocating genocide against Syria’s Alawite population such as ISIS and Nusra, because these gains bolstered the broader US goal of toppling the Syrian government, in an effort to weaken its close allies, Iran and Hezbollah. US planners wished to see rebel gains in Syria, in spite of the obviously catastrophic consequences for Syrian civilians that rebel success would bring. US support for the rebels belies the myth of US “inaction” in Syria, and the myth that any US intervention would be for the sake of preventing massacres and even genocide, rather than in support of it. The Syrian government is an authoritarian police state that has long been in need of drastic reform. Like all governments fighting a war, the Syrian government has killed civilians and committed crimes against innocent people during the course of the Syrian conflict (though the extent of these crimes has been massively inflated and often even fabricated in the Western press). Similarly, the Russian military deserves harsh criticism, as it has undoubtedly killed civilians unnecessarily during air strikes against the rebels. The deaths of these civilians are tragic, as are the deaths of civilians in Raqqa and Mosul killed by US bombs in the effort to defeat ISIS in those cities. It is unclear however, how Syrian civilians generally would have benefited if US planners had succeeded in accomplishing their goal of helping the predominantly jihadist Syrian rebels, including al-Qaeda and ISIS, topple the Syrian government. One Syrian fighting for a pro-government militia articulated why he and many Syrians in general oppose the rebels and the Syrian political opposition which supports them: “At first, my family sympathized with the protesters. But then it became obvious that the hardliners among the secular opposition work in the interests of Turkey and the Arab monarchies. Plus the course for Islamization was visible early on, and that was a concern. Like pretty much all normal people, my family, my friends and everyone I know in Syria are strongly against Wahhabis and religious extremism in general [emphasis mine],” with Wahhabism referring to the state ideology of Saudi Arabia, from which al-Qaeda and ISIS draw much of their inspiration. In Syria’s major population centers, civilians are terrified that the rebels will come, and look to the Syrian army to protect them. Large numbers of civilians leave any city where rebels gain a foothold and seek refuge primarily in government controlled areas of the country or outside of Syria itself. The threat of Syrian and Russian bombing certainly plays a role in this, but it is clear that rebel looting, the murder of minorities and those sympathetic to the government, and the imposition of extremist religious rule do not endear the rebels to Syria’s civilian population. Had Damascus and Latakia fallen to the rebels, not only Alawites and Christians, but also pro-government Sunnis and Sunnis opposed to Salafi-Jihadi ideology would have been massacred, not to mention members of Syria’s LGBTQ community. The Russian intervention in Syria then, by all indications, prevented this horrific outcome for Syrians of all ethnic and religious identities, despite the best efforts of US planners to achieve the “catastrophic success” in Syria they had hoped for. The Obama administration has carried out a deliberately deceptive campaign accusing Iran of covertly sending arms to the Houthis by sea, a claim that Washington cites to help justify the Saudi massive air attack against the Houthis that began last year. By repeating the accusation over and over, the administration has been largely successful in turning a dubious allegation into accepted fact, even though it is contradicted by evidence that is well-documented on the public record. The choice of wording was significant. The intelligence community says that it “assesses” that something is true only when it does not have clear-cut proof on the matter. In the case of the alleged Iranian use of fishing dhows to smuggle arms to the Houthis, the U.S. spokesmen did not cite a single piece of evidence for that “assessment” in any of the four cases. In fact, when asked for some justification for it, the military spokesman refused. The first fishing dhow was intercepted in the Arabian Sea on Sept. 25, 2015, by a member of a 31-nation coalition called the Combined Maritime Forces patrolling the Arabian Sea and nearby waters for piracy. The coalition ship found the dhow to be carrying 18 Konkurs anti-tank missiles, 71 other anti-tank shells and 54 missile-launchers. The U.S. Navy’s Fifth Fleet later issued a statement that said, “Based on statements from the dhow’s crew the port of origin of the dhow and its illicit weapons cache is believed to be Iran.” It also said the anti-tank missiles were thought to be of Iranian and Russian origin, and that the papers on the ship had indicated that it had been checked by ports and customs officials in Iran’s Sistan and Baluchistan province. 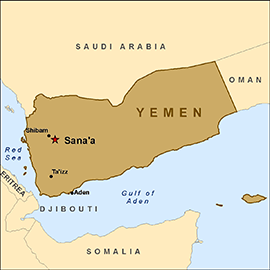 But the crew of the vessel had said that it was bound not for Yemen but for Somalia, as the spokesman for the U.S. Fifth Fleet acknowledged to The Associated Press. A Saudi military spokesman suggested that Iran intended to reroute the arms later from Somalia to Yemen, but offered no evidence. On Feb. 27, 2016, an Australian ship intercepted a second fishing dhow off the coast of Oman. The Australians found 1,989 AK-47 assault rifles, 100 rocket-propelled grenades and 40 PKM machine guns on board. The Australian Defense Force issued an official statement on the seizure that did not mention Iranian involvement. It said the boat appeared to be “stateless” and that its cache of weapons was “destined for Somalia.” The Australian Defense Force spokesman explained to CNN that the conclusion was based on interviews with crew members. But a spokesman for U.S. Naval Forces, Central Command, Lt. Ian McConnaughey gave an entirely different political slant to the interception. In an e-mail to NBC News, McConnaughey said. “Based on the dhow’s course, Iran is believed to be its port of origin and the source of the illicit weapon,” he said. McConnaughey said the crew was “assessed” to be Iranian – implying that the crew itself had not indicated that. McConnaughey acknowledged to NBC and The Telegraph, “According to coalition forces it is believed that the vessel’s destination was in the vicinity of Somalia.” But the CENTCOM spokesman indicated that it didn’t matter; the U.S. was insisting on its narrative about covert Iranian arms to the Houthis. “[T]he initial U.S. assessment is the weapons’ final destination was likely to be the Houthis in Yemen,” McConnaaughey told NBC and The Telegraph. And because the weapons were “deemed to be destined for Somalia,” it explained, they “were seized under the United Nations Security Council mandated arms embargo in accordance with UNSCR 2244(2015).” That Security Council resolution mandates an embargo on Eritrea. Australia and other states participating in the Combined Maritime Forces were thus challenging the U.S. propaganda line. But again the U.S. military used the news media to reinforce the line about Iran smuggling arms to the Houthis. Commander Kevin Stephens, a spokesman for the Fifth Fleet, told CNN that “according to a U.S. assessment,” Yemen was the “likely destination” of the arms. A fourth interception – the third in three weeks – occurred on March 28 by a U.S. Navy ship that was not operating as part of Combined Maritime Forces but directly under U.S. Naval Forces Central Command. That allowed the Naval Forces Central Command to issue its own news story on April 4. The Obama administration also had sought to promote the charge that Iran was covertly sending weapons to the Houthis by sea more than two years earlier. In January 2013, the Yemen client government backed by the United States and Saudi Arabia had claimed that its forces had intercepted a ship with a large cargo of weaponry that came from Iran and was on its way to Yemen to deliver them to the Houthis. The Obama administration supported that charge in briefings to journalists. After the Saudi air war against Yemen began in 2015, the U.S. pushed for a report by an experts group on sanctions against Iran that would give the charge credibility. But the 2013 claim was soon exposed as a ruse. A Security Council Monitoring Group on Somalia and Eritrea revealed in a June 2013 report that the crewmembers had told diplomats who interviewed them that ship’s cargo of diesel fuel was bound for Somalia, not Yemen. And, since the weapons were hidden under the diesel fuel tanks, the weapons could be accessed only after those tanks had been emptied, in other words after the ship docked in Somalia. The monitoring group learned from authorities in the Puntland region of Somalia, where most of the smuggled weapons have entered the country, that this was a widely used method of smuggling arms into the country. Furthermore, the monitoring group determined that the wide range of types of weapons on board the ship, which was intercepted in January 2013, as well as of their original sources indicated that the weapons cache had been assembled by arms merchants. Authorities in Puntland provided data to the monitoring group showing that most of the shipments of weapons into Puntland in the months before January 2013 had come from politically well-connected arms merchants in Yemen. Some of the fishing boats that were intercepted with illicit arms on board in 2015-16 had Iranian owners. But the monitoring group report reveals that the real reason is the role of such Iranian fishing vessels in illegal fishing in Somali waters. The vast majority of the hundreds of fishing vessels involved in such illegal fishing networks were either Iranian or Yemeni. As many as 300 were believed to be Yemeni-owned, while Iranian-owned 180 of them. But the Obama administration has no interest in the considerable evidence gathered by the monitoring group that provides a more credible explanation for the arms found on those four fishing dhows. To be sure, the sub-zero temperature in US-Russia relations has dipped by another ten degrees centigrade. Even in the height of Cold War, when the former Soviet Union used to be an ‘evil empire’, Washington had never sought that the Kremlin officials should be tried for war crimes. Nor had the Soviet Union. Even after killing hundreds of thousands of Iraqi, Libyan and Afghan civilians and the wanton destruction of those countries in the past decade or so, and even though the US is actively taking part in the war in Yemen, Moscow never demanded that George W. Bush or Barack Obama – or even Hillary Clinton – should be tried as war criminals. What has come over Kerry? He sounds a frustrated man who’s lost his cool. He realizes that his Russian counterpart Sergey Lavrov outwitted him, whereas he’d thought he’s clever by half. The US hoped to somehow preserve the al-Qaeda affiliate Nusra in order to spearhead one more final push for ‘regime change’ in Syria – if not under the Obama presidency, at least under the next president. Indeed, Lavrov saw through Kerry’s ploy – ultimately, Kerry, a clever politician with some experience in diplomacy, couldn’t be a match for the immensely experienced career diplomat and intellectual in Lavrov. So, Lavrov played along with a poker face and entrapped ‘John’ in a peace agreement that Pentagon would never approve, which actually aimed at making mincemeat out of Nusra. The third fascinating aspect of Kerry’s apocalyptic remark is that he seems to suggest that the US still intends to win the war in Syria. After all, it is a consistent trait of history that the winner dispatches the defeated to the war crimes tribunal – be it Slobodan Milosevic or Saddam Hussein. Put differently, does Kerry mean that the US intends to defeat Russia in a war? Is it his prognosis that World War III is round the corner? Doesn’t he comprehend that the total annihilation of his own country in a nuclear showdown with Russia would make all this talk about war crimes irrelevant? Kerry must be feeling frustrated that the Nobel went to the Columbian president! What a way to end a distinguished career in politics and diplomacy when there is no grand recognition for the good work done! Kerry leaves the stage of international diplomacy an embittered man. Lavrov is unlikely to respond. What can he say, after all? Kerry overreached to reverse the tide of history and the result was fairly predictable. No matter his valiant attempts, he couldn’t erase the geopolitical reality that the US is a power in retreat. Not only in the Middle East, but also in Asia-Pacific. 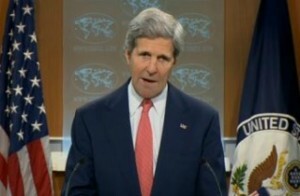 Secretary of State John Kerry has engaged in another rush to judgment blaming the Russians for an attack on a United Nations relief convoy in Syria before any thorough investigation could be conducted and thus prejudicing whatever might follow, as he did with the Syrian sarin case in 2013 and the shoot-down of Malaysia Airlines Flight 17 in 2014. Eager to go on the propaganda offensive – especially after a U.S. military airstrike last Saturday killed scores of Syrian soldiers who were battling the Islamic State in eastern Syria – Kerry pounced on an initial report that the attack on the convoy on Monday was an airstrike and then insisted that the Russians must have been responsible because one of their jets was supposedly in the area. But the United Nations – and I’m told CIA analysts – have not ruled out the possibility that the convoy was instead hit by a surface-to-surface missile. On Friday, a source briefed by U.S. intelligence said one fear is that the jihadist group, Ahrar al-Sham, which has fought alongside Al Qaeda’s Nusra Front but is deemed to be part of the “moderate” opposition, may have used a U.S.-supplied TOW missile in the attack. Ahrar al-Sham, like some other jihadist groups seeking to overthrow the Syrian government, has objected to limited cease-fires arranged by the Russians and the Americans, which still allowed attacks on its ally, the recently rebranded Nusra Front. Ahrar al-Sham thus had a motive for destroying the aid convoy, an act which indeed has upended efforts to negotiate an end to the five-year-old conflict and led to bloody new attacks inside the embattled city of Aleppo on Friday. Another possibility was that a Syrian government warplane was targeting a rebel artillery piece traveling alongside the convoy and struck the convoy by accident. But the assignment of blame required additional investigation, as other international officials acknowledged. On Tuesday, a day before Kerry’s outburst, the U.N. revised its initial statement citing an airstrike, with Jens Laerke, a humanitarian affairs representative for the U.N., saying: “We are not in a position to determine whether these were in fact airstrikes. We are in a position to say that the convoy was attacked.” He called the earlier reference to an airstrike a drafting error. Nevertheless, on Wednesday, Kerry made his high-profile denunciation of the Russians at the U.N. Security Council, the same venue where Secretary of State Colin Powell in 2003 presented a false case against Iraq for possessing hidden stockpiles of WMD. In fiery comments, Kerry accused Russian Foreign Minister Sergey Lavrov of living “in a parallel universe” in denying Russian responsibility. Yet, the two points don’t necessarily connect. Just because there are jets in the sky doesn’t mean they fired the rocket that struck the convoy. They might have, but to determine that – and if so, who was flying the jet that fired the missile – requires more thorough study. But what Kerry ignored was the fact that the United States has no legal authority to be conducting military operations inside Syria, attacks supposedly targeting the terrorist Islamic State but lacking the approval of the Syrian government. In other words, under international law, any such U.S. attacks are acts of aggression and thus war crimes. The mainstream U.S. news media, however, has little regard for international law, at least when the U.S. government is violating it, nor particular care for factual details. Despite the U.N.’s uncertainty about what struck the convoy, The New York Times continued to report the airstrike as a flat fact. Kerry also has a history of jumping ahead of a story and then going silent when further information is developed. On Aug. 30, 2013, Kerry gave a thunderous speech virtually declaring war on Syria for supposedly launching a sarin gas attack outside Damascus on Aug. 21, 2013, that killed hundreds of people. On Aug. 31, however, President Obama pulled the rug out from under Kerry by shelving plans for a retaliatory bombing campaign, in part, because U.S. and British intelligence analysts expressed doubts that the Syrian government was responsible. But U.N. investigators have remained under intense pressure to give the U.S. government something so it can keep alive the theme of Syria’s government using chemical weapons, even after Syria agreed to surrender all its chemical weapons in 2013. The U.N. did so in late August in blaming the Syrian government for two thinly evidenced cases of jerry-rigged chlorine bombs, after brushing aside witness testimony that rebels were staging such attacks for propaganda purposes. Regarding the sarin case, the U.S. government never formally recanted Kerry’s rush to judgment allowing the conventional wisdom inside Official Washington (and its compliant mainstream media) to remain that Obama failed to enforce his “red line” against use of chemical weapons. Kerry was at it again just three days after Malaysia Airlines Flight 17 was shot down over eastern Ukraine on July 17, 2014, insisting that the U.S. government had radar and other conclusive evidence showing exactly where the missile was fired and making clear that Russian-backed rebels were responsible with the Russians also at fault for giving the rebels the anti-aircraft weapon. However, after CIA and other Western intelligence analysts had more time to review what actually happened – and found that only Ukrainian government forces had anti-aircraft missiles in the area capable of shooting down a plane at 33,000 feet – the U.S. government went silent, refusing to make public its evidence but keeping alive the impression that the Russians were at fault. On Sept. 28, a Dutch-led-but-Ukrainian-dominated Joint Investigation Committee (JIT) is scheduled to release a report that is supposed to finally say where the missile was fired, more than two years after the tragedy. Given the influence of Ukraine’s SBU intelligence service over JIT, the likelihood is that the report will try to keep alive the impression that the ethnic Russian rebels were responsible. A source who’s been following the investigation said the Dutch have resisted the outright falsification of the findings because many of the 298 victims were Dutch citizens and the victims’ families have been pressing for all sides – the United States, Ukraine and Russia – to supply whatever evidence they can. But the Western demands for propaganda to support the New Cold War with Russia are strong. Syria has become another battlefield in that information war with tragic events being used as propaganda clubs by the various sides to beat one another, rather than moments for careful review of the evidence and assessment of accountability. Part of this propaganda overload results from the U.S. government and various Western non-governmental organizations funding and training activists in the art of using social media for propaganda purposes. While these activists report on some real events, they also slant their coverage to advance their agenda of “regime change” in Syria. The problem is compounded because the Western mainstream media has taken up Syrian “regime change” as a beloved cause rather than a topic for objective reporting. The New York Times and other major news outlets rely credulously on anti-government activists, such as the White Helmets and the Syrian Observatory for Human Rights, for information about what’s happening on the ground with statements from the Syrian or Russian governments treated with open disdain. The larger tragedy of exploiting these human tragedies for propaganda purposes – whether the sarin attack, the MH-17 shoot-down or now the convoy bombing – is that these deaths of innocents become just excuses to inflict more deaths and ultimately to push the world closer to a new world war. “A no-fly zone (in Syria) will benefit terrorists, who have everything except for military aircraft,” Rouhani said during a presser after his speech at the 71st United Nations General Assembly session in New York on Thursday. “They have mortar shells, tanks, missiles and armored personnel carriers. They have cannons and artillery batteries but no warplanes. The creation of a no-fly zone is a not a right step. This is an ill-advised suggestion,” the Iranian president added. “Saudi Arabia is making a miscalculation” over its aggression against Yemen. About two years of bombardment of Yemen has had no achievement for them, and has been devastating for the people of Yemen,” the Iranian president said. Can anyone even imagine Kerry – this man who, once not long ago, reminisced over Champagne toasts about some distant relative or another of his who was allegedly part-Jewish (truly, has grovelling by a Secretary of State reached such levels before? I would have expected his entire audience either to choke or throw up) – ever saying a single word to Israel about its walls, walls which go far beyond serving Israel’s border fears to literally chopping up and destroying the land which supports millions of other people? It would be as though Trump were demanding a series of walls inside Mexico to balkanize the entire country and then set about building them himself with America’s armed forces. Now that would be utterly ridiculous, not to say criminal, but Israel’s doing just that is never called ridiculous or criminal, and it certainly is never questioned by Kerry. US Secretary of State John Kerry wants to draw “absolute” lines across Syria to create the Western “areas of influence” there. Such an approach resembles nothing so much as neo-colonialism, experts say. The idea to create spheres of influence in Syria voiced recently by US Secretary of State John Kerry clearly indicates that Washington continues to pursue its Plan B in Syria. In his interview with The New York Times editorial board Kerry narrated that the White House proposed to draw clear lines in Syria to the Kremlin. “We’ve even proposed drawing a line, an absolute line, and saying, ‘You don’t go over there, we don’t go over here, and anything in between is fair game.’ And they are considering that, and I think we will get there in the next week or so,” Kerry told the editorial board. However, according to the Russian Foreign Ministry, such an approach is oversimplified. “This approach is slightly simplistic. The principal goal is to fight against terrorism [in Syria],” Russian Foreign Minister Sergei Lavrov said during a press conference on Monday, as quoted by RIA Novosti. It should be noted that Kerry’s ‘offer’ followed the Saudi-backed High Negotiations’ Committee (HNC) decision to suspend its participation in the Geneva talks on April 21. On that day most HNC members left Geneva in protest against the ongoing violence in Syria which they blindly blame on Damascus. The HNC is well-known for its anti-Assad stance. However, by no means the entity represents the Syrian opposition as a whole. The HNC brought together Saudi-backed rebels in Syria, including notorious Ahrar ash-Sham and Jaysh al-Islam groups which actually share the same Islamist ideology as Daesh and al-Qaeda’s affiliate al-Nusra Front. A day after the HNC demarche Lavrov called attention to the fact that besides the HNC there are also the Moscow and Cairo groups, Hmeymim group and the group of independent opposition members which express their willingness to continue the dialogue with Damascus over the situation in Syria.”Some people have already left [the Syrian opposition’s] High Negotiations Committee [HNC]. They disagreed that radicals ruled the committee, including Jaysh al-Islam leaders. This fact confirms that we were right while proposing to include it in the list of terrorist groups… This group, as well as Ahrar ash-Sham are actively proving in action that they fully support those anti-humane, brutal approaches used by Daesh and Jabhat al-Nusra [al-Nusra Front],” the Russian Foreign Minister underscored. According to Elena Suponina, President of the Center for Asia and the Middle East at the Russian Institute for Strategic Studies, John Kerry’s offer to divide Syria into spheres of influence with Russia means that Washington now regards Moscow as an equal player in the Middle East. In her Op-Ed for RIA Novosti Suponina recalls, that four years ago the Obama administration did not even bother to take Russia’s interests in the region into consideration. However, in general, the White House continues to demonstrate a double-standard approach toward Syria and other regional players, according to the expert. “It looks as if the colonial epoch and the times of re-division of the world by global powers have returned” Suponina writes, calling attention to the fact that Western policy-makers (most notably John Kerry himself) have repeatedly claimed that it is highly inappropriate to behave “in 19th-century fashion” in the 21st century. Kerry’s “fair game” in Syria will most likely prompt more destruction and devastation. Is Washington ready to take responsibility for chaos in the region? On the other hand, Kerry’s proposal looks rather controversial since it was Russia, not the US that was invited to Syria by the legitimate Syrian government. In his interview with Radio Sputnik political scientist Alexander Kamkin echoed Suponina’s stance.”Genuine peace still looks a way off and it looks like the Western nations still hope to implement the Libyan scenario in Syria… They use the war with Daesh as just a means of building large coalitions, but if you look at the previous such campaigns you will see that our American ‘partners’ rarely practice what they preach,” Kamkin told Radio Sputnik. Hans-Christof Von Sponeck, former UN Assistant Secretary-General, expressed his concerns regarding the fact that Washington continues to conduct a “series of experiments” in Syria. “The Americans are never short of experiment, never short of trying something new… It is jumping from one laboratory test to another, and in the meantime the country continues to go further towards a destroyed nation,” Sponeck told Russia Today. Interestingly enough, it seems that there is no concordance in Washington regarding what to do next in Syria. US President Barack Obama said Sunday that he does not support the idea of creating so-called “safe” or “buffer” zones in Syria as it would need Washington’s deeper military involvement in the region. At the same time, Obama has signaled that 250 US Special Operation Forces troops will be soon deployed in the war-torn country. What surprised me most about the Iraq War wasn’t how wrong the expectation of happy Iraqis showering American troops with flowers was or even how badly the war would turn out – all that was predictable and indeed was predicted. But what I didn’t expect was that the U.S. government would ever admit that there were no WMD stockpiles. I assumed that the U.S. government would do what it usually does: continue the lie to protect its “credibility.” Because that is what “credibility” has become, powerful institutions and people maintaining the aura of being right even when they’re completely wrong. There is even a national security argument to be made: If the U.S. government must justify its actions to the American people and the world with propaganda themes, it can’t simply admit that previous ones were lies because then it would lose all “credibility.” The next time, the public might not be as open to the propaganda. The people might catch on. And that would present a problem to the U.S. government, which feels it needs the approval or at least the confused acquiescence of the American people and to a lesser extent the world before charging off to war or starting some expensive confrontation with a foreign power. So, in a sick kind of way, it makes more sense to stick with the lie and rely on a corrupted mainstream media to hold the line. Anyone who dares challenge the falsehoods then can be discredited or marginalized. After all, the U.S. government rarely corrects its misstatements and outright lies, no matter how significant they may be. For instance, there’s never been a formal admission that the Gulf of Tonkin claims, which launched the Vietnam War, were false. On a smaller scale, I encountered something similar when I was covering the U.S. invasion of Grenada in 1983. The Reagan administration massively exaggerated the discovery of some useless World War I era rifles in a musty-smelling warehouse to claim that the little Caribbean island was about to be transformed into the hub of terrorism for the Western Hemisphere. As absurd as the claim was, it worked well enough amid a well-staged propaganda campaign complete with American students kissing the tarmac when they returned to the United States and members of Congress waving around some Grenada government contracts — in Russian. We are now seeing similar dig-in-the-heels strategies regarding Syria and Ukraine. Though I’m told that U.S. intelligence knows that the Obama administration’s propaganda is no longer operative on the 2013 sarin gas attack outside Damascus and the 2014 shoot-down of the Malaysia Airlines Flight 17 in eastern Ukraine, the storylines won’t be retracted or corrected. To do so – to say that President Bashar al-Assad’s forces weren’t responsible for the sarin attack and that the Russians weren’t behind the MH-17 catastrophe – would destroy the propaganda narratives that have been useful in justifying the shipment of arms to Syrian rebels and the launching of a new Cold War against Moscow. If the American people and the world public were informed that they had been misled on such sensitive topics – and that the real guilty parties might include people getting American support – that could devastate U.S. government “credibility” and disrupt future plans. Therefore, mounting evidence that Assad didn’t cross President Obama’s “red line” against using chemical weapons on Aug. 21, 2013, must be brushed aside or forgotten. In a classic show of cognitive dissonance, The Atlantic’s Jeffrey Goldberg recently reported that Director of National Intelligence James Clapper told Obama that U.S. intelligence had no “slam dunk” evidence of Assad’s guilt. But Goldberg then continued his long article on Obama’s foreign policy as if Clapper’s warning never happened and as if Assad were indeed guilty. Since then, major American columnists writing about Goldberg’s article have simply ignored the Clapper revelation, which tended to confirm earlier reporting at some independent Web sites, including Consortiumnews.com, and by investigative reporter Seymour Hersh, who traced the sarin to a likely operation by Islamic radicals aided by Turkish intelligence. But those Assad-didn’t-do-it reports were almost universally ignored, except for the occasional ridicule. The problem for the columnists – and for the rest of Official Washington’s insider community – was that Everyone Who Mattered had already declared as flat fact that Assad crossed Obama’s “red line” with the sarin attack. So what would happen to their “credibility” if they admitted that they were wrong again, since many also had been famously wrong about Iraq’s WMD? Plus, who could force these Important People to face up to their own misfeasance and malfeasance? Does anyone expect that Secretary of State John Kerry, who sought war against Syria in retaliation for the sarin attack, will retract what he claimed repeatedly that “we know” about Assad’s guilt? What would that do to Kerry’s “credibility”? Kerry also was on the front lines pointing the finger of blame at Russia for the MH-17 shoot-down on July 17, 2014. He rushed off to the Sunday TV shows just three days after the tragedy over eastern Ukraine that killed 298 people and made the case that Moscow and the ethnic Russian rebels were to blame. A source who had been briefed by U.S. intelligence analysts in that same time frame was telling me that it was already clear to them that an element of the Ukrainian military was responsible. But hanging the slaughter of all those innocents around Russian President Vladimir Putin’s neck was just too tempting – and served U.S. propaganda needs to get Europe to join in economic sanctions against Russia and to let the U.S. government rev up a new and costly Cold War. But those U.S. propaganda desires have put the Dutch in a difficult spot, since they are leading the investigation into the crash which departed from Amsterdam and carried many Dutch citizens en route to Kuala Lumpur. Part of the Dutch problem is that Dutch intelligence has confirmed that the only Buk or other anti-aircraft missiles in eastern Ukraine capable of hitting a commercial airliner at 33,000 feet belonged to the Ukrainian military. 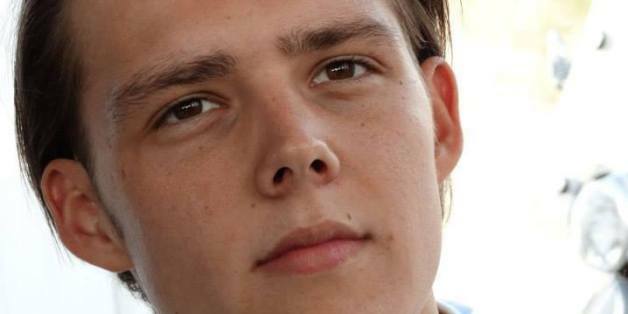 Recently, the Obama administration also had to decide how to respond to a letter from Thomas Schansman, the father of the only U.S. citizen killed in the crash, Quinn Schansman. In a letter dated Jan. 5, 2016, Schansman asked Secretary Kerry to release the radar and other evidence that he claimed to have in summer 2014 that supposedly showed where the missile was fired, a basic fact that the Dutch investigation has yet to nail down. One of the many anomalies of the MH-17 case was Kerry’s assertion within three days of the crash that the U.S. government had precise information about the launch but then has left Dutch investigators struggling to figure out that detail for nearly two years. As the months wore on – passing the first anniversary of the crash and then after last October’s inconclusive report by the Dutch Safety Board – Thomas Schansman finally reached out to Kerry directly with his Jan. 5 letter. More weeks and months passed before Schansman received Kerry’s reply on March 24, although the letter was curiously dated March 7. The letter offered no new information as Kerry stuck to the old story. Recently, I was told that a possible explanation for the delay in the letter’s delivery was that a discussion was underway inside the Obama administration about whether to finally come clean about MH-17 even if that would clear Russia and the ethnic Russian rebels and shift the blame onto a rogue or poorly disciplined unit of the Ukrainian military. But the decision was made to stand pat, the source said, explaining that otherwise “the narrative would be reversed,” throwing the U.S.-backed Ukrainian government on the defensive and negating some of the propaganda advantages gained against Russia. Plus, if the U.S. government admitted that it had played such a cynical propaganda game, which also smacks of obstruction of justice by giving the actual culprits nearly two years to make their escape and cover their tracks, there would be a loss of “credibility” in Washington. Apparently, it made more geopolitical sense to keep the heat on Russia and then to lean on the Dutch authorities to fit their investigative findings around the needs of the NATO alliance. That is, after all, how the U.S. government usually operates. It’s also why I was so surprised that the truth finally was told about Iraq not possessing the WMD. The United States and its regional allies have prepared plans to supply more-powerful weapons to militants fighting the Syrian government, amid concerns that a landmark ceasefire is threatening to fall apart. US officials said the so-called Plan B is aimed at providing vetted “moderate” militant units with weapons system that would enable them to launch attacks against Syrian government aircraft and artillery positions, the Wall Street Journal reported on Tuesday. US-backed militants carried out a series of attacks in central and southern Syria on Monday even as the Damascus government was observing a ceasefire and holding talks with opposition groups to end the years-long conflict. A ceasefire brokered by the US and Russia went into effect on February 27 across Syria. The truce agreement does not apply to Daesh and al-Qaeda-affiliated al-Nusra Front. A new round of discussions is to resume between the two sides in Geneva this week. Concern has been growing that the recent uptick in violence is putting intense strain on the fragile truce. US Secretary of State John Kerry floated the idea of a “Plan B” for the first time late in February, stressing that partitioning of Syria was on the table if the ceasefire collapsed. The preparations for the “Plan B” were discussed at a secret gathering of intelligence chiefs in the Middle East before the ceasefire went into effect and in exchanges between intelligence services, the Journal said. During those sessions, the CIA gave assurances to allies that they would be given approval to expand arms shipments to Syria’s “moderate” militants. Coalition members reportedly agreed to the outlines of the plan, but the White House must approve the list of proposed weapons systems before they can be sent to Syria. “The agreement is to up the ante, if needed,” a senior US official said. The plan for introducing more sophisticated weapons into the Syrian battlefield is perceived as being part of a broader behind-the-scenes effort by the US to counter its adversaries in the conflict. US officials have privately warned their Russian counterparts that the armed opposition will persist in Syria and that a return to full-scale fighting could put further strain on Russian pilots there, according to the Journal. In addition, Pentagon officials said in recent weeks that the White House was looking to “greatly increase” the number of special forces deployed in Syria. The US military also said that it had resumed training new units of militants operating in the country. The discussions for a possible escalation of the proxy war in Syria have been fueled to a large extent by a relatively successful Russian campaign in the country. Visiting US Secretary of State John Kerry will not offer any apologies to the people of Hiroshima over the 1945 atomic bombing of the Japanese city, a senior US official says. Kerry arrived in Hiroshima on Sunday and is reportedly arranging for a trip by President Barack Obama as the first US president to visit the city, as part of his trip to Japan for a G7 summit in late May. “If you are asking whether the secretary of state came to Hiroshima to apologize, the answer is no,” a senior US official told reporters Sunday, on condition of anonymity. “If you are asking whether the secretary and I think all Americans and all Japanese are filled with sorrow at the tragedies that befell so many of our countrymen, the answer is yes,” he noted. Kerry and a number of other foreign ministers are slated to visit Peace Memorial Park as well as a museum dedicated to the obliteration of the city by an American atomic bomb on August 6, 1945. The bombing killed nearly 140,000 people and was shortly followed by another US atomic bombing on the port city of Nagasaki, killing about 70,000 people three days later. Kerry was visiting the memorial to “recognize the huge loss of life” during the war, said State Department spokesman Mark Toner. “It is also an acknowledgement that since the end of World War II that the United States and Japan have become the closest of friends and strong allies,” he added. Diplomats from nuclear-armed Britain and France, as well as Canada, Germany, Italy and Japan will also partake in the G7 meeting. Kerry’s trip to Japan comes after a visit to Afghanistan where he met with Afghan President Ashraf Ghani on Saturday. Last month, US secretary of State John Kerry called for Syria to be partitioned saying it was “Plan B” if negotiations fail. But in reality this was always plan A. Plans to balkanize Syria, Iraq and other Middle Eastern states were laid out by former U.S. Secretary of State Condoleezza Rice in a 2006 trip to Tel Aviv. It was part of the so called “Project For a New Middle East”. This was a carbon copy of the Oded Yinon plan drawn up by Israel in 1982. The plan outlined the way in which Middle Eastern countries could be balkanized along sectarian lines. This would result in the creation of several weak landlocked micro-states that would be in perpetual war with each other and never united enough to resist Israeli expansionism. Kerry’s plan B comment came right before the UN’s special envoy de Mistura said federalism would be discussed at the Geneva talks due to a push from major powers. Both side’s of the Geneva talks, the Syrian Government and the Syrian National Coalition flat out rejected Federalism. Highlighting the fact that the idea did not come from the Syrian’s themselves. The Syrian ambassador to the United Nations, Bashar Al Jaafari, said that the Idea of federalization would not be up for discussion. “Take the idea of separating Syrian land out of your mind,” he would say. But some may not completely understand the full implications of federalism and how it is intrinsically tied to balkanization. Some cite the fact that Russia and the United States are successful federations as evidence that federation is nothing to fear. However the point that makes these federalism statements so dangerous is that in accordance with the Yinon plan the borders of a federalized Syria would be drawn along sectarian lines not on whether any particular state can sustain its population. This means that a small amount of people will get all the resources, and the rest of Syria’s population will be left to starve. Furthermore, Russia and the US are by land mass some of the largest nations in the world, so federalism may make sense for them. In contrast Syria is a very small state with limited resources. Unlike the US and Russia, Syria is located in the Middle East which means water is limited. In spite of the fact Syria is in the so-called fertile crescent, Syria has suffered massive droughts since Turkey dammed the rivers flowing into Syria and Iraq. Syria’s water resources must be rationed amongst its 23 million people. In the Middle East, wars are also fought over water. The areas that the Yinon plan intends to carve out of Syria, are the coastal areas of Latakia and the region of Al Hasake. These are areas where a substantial amount of Syria’s water, agriculture and oil are located. The intention is to leave the majority of the Syrian population in a landlocked starving rump state, and create a situation where perpetual war between divided Syrians is inevitable. Ironically promoters of the Yinon plan try and paint federalism as a road to peace. However, Iraq which was pushed into federalism in 2005 by the US occupation is far from peaceful now. Quite simply, divide and conquer is the plan. This was even explicitly suggested in the headline of a Foreign Policy magazine article, “Divide and conquer Iraq and Syria” with the subheading “Why the West Should Plan for a Partition”. The CEO of Foreign Policy magazine David Rothkopf is a member of to the Council of Foreign Relations, a think tank Hillary Clinton admits she bases her policies on. Another article by Foreign Policy written by an ex-NATO commander James Stavridis, claims “It’s time to talk about partitioning Syria”. The US hoped to achieve this by empowering the Muslim Brotherhood and other extremist groups, and introducing Al Qaeda and ISIS into Syria. The Syrian army was supposed to collapse with soldiers returning to their respective demographic enclaves. Evidence of this could be seen in the headlines of NATO’s media arm in 2012, which spread false rumours that Assad had run to Latakia, abandoning his post in Damascus. The extremists were then supposed to attack Alawite, Christian and Druze villages. The US hoped that enough Alawites, Christians and Druze would be slaughtered that Syria’s minorities would become receptive to the idea of partitioning. Then NATO planned on shifting narratives from, ‘evil dictator must be stopped” to “we must protect the minorities”. Turning on the very terrorists they created and backing secessionist movements. There is evidence that this narrative shift had already started to happen by 2014 when it was used to convince the US public to accept US intervention in Syria against ISIS. The US designation of Jabhat Al Nusra as a terrorist organisation in December of 2012 was in preparation for this narrative shift. But this was premature as none of these plans seemed to unfold according to schedule. Assad did not leave Damascus, the Syrian army held together, and Syrian society held onto its national identity. It could be said that the Yinon plan had some success with the Kurdish PYD declaration of federalization. However, the Kurdish faction of the Syrian national coalition condemned PYD’s declaration. Regardless, the declaration has no legal legitimacy. The region of Al Hasakah where a substantial portion of Syria’s oil and agriculture lies, has a population of only 1.5 million people, 6% of Syria’s total population. Of that, 1.5 million, only 40% are Kurdish, many of which do not carry Syrian passports. PYD’s demand that the oil and water resources of 23 million people be given to a tiny part of its population is unlikely to garner much support amongst the bulk of Syria’s population. Former US National Security Adviser Henry Kissinger understood that the key to dismembering a nation was attacking its national identity. This entails attacking the history from which this identity is based upon. In an event at Michigan University Kissinger stated that he would like to see Syria balkanized, asserting that Syria is not a historic state and is nothing but an invention of the Sykes-Picot agreement in the 1920’s. Interestingly, Kissinger is using the same narrative as ISIS, who also claim that Syria is a colonial construct. In fact, ISIS has been a key tool for Kissinger and the promoters of the project of a New Middle East, as ISIS has waged a campaign of destruction against both Syrian and Iraqi historical sites. In spite of efforts to convince the world of the contrary, the region that now encompasses modern day Syria has been called Syria since 605 BC. Sykes-Picot didn’t draw the borders of Syria too large, but instead, too small. Historic Syria also included Lebanon and Iskandaron. Syria and Lebanon were moving towards reunification until 2005, an attempt at correcting what was a sectarian partition caused by the French mandate. Syria has a long history of opposing attempts of divide and conquer, initially the French mandate aimed to divide Syria into 6 separate states based on sectarian lines, but such plans were foiled by Syrian patriots. The architects of the Yinon plan need only have read Syria’s long history of resistance against colonial divisions to know their plans in Syria were doomed to failure. Maram Susli also known as “Syrian Girl,” is an activist-journalist and social commentator covering Syria and the wider topic of geopolitics. Secretary of State John Kerry has rebuffed a request from the father of the only American citizen killed aboard Malaysia Airlines Flight 17 for Kerry to disclose the radar and other data that he cited in 2014 in claiming to know the precise location of the missile launch that allegedly downed the airliner over eastern Ukraine killing 298 people. In a letter to Kerry dated Jan. 5, 2016, Thomas Schansman, the father of American-Dutch citizen Quinn Schansman, asked Kerry to turn over that data to aid the investigation seeking to identify who was responsible for shooting down the plane on July 17, 2014. In a letter dated March 7, 2016, but just delivered to Thomas Schansman on Thursday, Kerry expressed his condolences and repeated his claim to know where the missile launch originated, but did not provide new details. But Kerry’s assertion is not entirely correct. Despite Kerry’s claim on July 20, 2014 – three days after the shoot-down – to know the location of the missile launch, the Dutch Safety Board reported last October that it could only place the likely launch site within a 320-square-kilometer area that included territory under both government and rebel control. (The safety board did not seek to identify which side fired the fateful missile). Why the U.S. government has dragged its heels about supplying the evidence that Kerry claimed to possess just days after the tragedy has become a secondary mystery to the allegations and counter-allegations about whodunit. That Kerry would not even elaborate on that information in response to the father of the lone American victim is even more striking. Plus, Kerry’s credibility has come under a darkening cloud because of recent disclosures undermining his repeated claims on Aug. 30, 2013, that “we know” that Syrian government forces were responsible for the Aug. 21, 2013 sarin gas attack outside Damascus. Despite Kerry’s assertions of certainty in that case, he presented no verifiable evidence and it has since been confirmed that the U.S. intelligence community lacked “slam dunk” proof. Nearly a year after his “we know” performance regarding the Syria-sarin case, Kerry staged a reprise expressing similar certainty about the MH-17 case – again dumping the blame on the target of an intensive U.S. propaganda campaign, this time Russia, which was backing the rebels in eastern Ukraine. Kerry again failed to supply supporting evidence. Also, some of Kerry’s MH-17 assertions have shown cracks as more information has become available. For instance, despite Kerry’s putting the blame on the ethnic Russian rebels and their supporters in Moscow, Western intelligence now says the only functioning Buk anti-aircraft missiles in the area were under the control of the Ukrainian military. According to Dutch intelligence – and implicitly corroborated by U.S. intelligence – Ukraine’s Buk batteries were the only anti-aircraft missiles in the area capable of hitting a commercial airliner flying at 33,000 feet. That information was contained in a little-noticed Dutch intelligence report last October citing information from the Netherlands’ Military Intelligence and Security Service (MIVD). U.S. intelligence, which had eastern Ukraine under intensive overhead surveillance in summer 2014, implicitly corroborated MIVD’s conclusion in a U.S. “Government Assessment” released by the Director of National Intelligence on July 22, 2014. It listed weapons systems that Russia had provided the rebels but made no mention of a Buk missile battery. In other words, based on satellite imagery and other intelligence reviewed both before and after the shoot-down, U.S. and other Western intelligence services could find no proof that Russia had ever given a Buk system to the rebels or introduced one into the area. If Russia had provided a Buk battery – four 16-foot-long missiles hauled around by trucks – it would have been hard to miss. There was also logic to support the notion that a Ukrainian team may have been responsible for the MH-17 shoot-down. At the time, the Ukrainian military was mounting an offensive against the rebels, who had resisted a U.S.-backed coup on Feb. 22, 2014, which ousted elected President Viktor Yanukovych, who had strong support among Ukraine’s ethnic Russian minority in the east. As the Ukrainian offensive claimed territory that the rebels had held, the Ukrainian military moved several Buk anti-aircraft missile batteries toward the front, presumably out of concern that Russia might directly intervene to save the rebels from annihilation. Plus, on July 16, 2014, a Ukrainian warplane was shot down apparently by an air-to-air missile believed fired by a Russian jet, giving reason for the Ukrainian anti-aircraft batteries to be on edge the next day, looking for Russian aircraft possibly intruding into Ukraine’s airspace. But this evidence – that the only operational Buk batteries were under control of the Ukrainian military – did not fit the U.S. propaganda needs of blaming Russia and the rebels. Any indication that the post-coup Ukrainian government was responsible would instead put the U.S.-backed Kiev regime in a negative light. So, it makes sense in a “strategic communications” kind of way for Kerry and other U.S. officials to leave the conventional wisdom – blaming Russian President Vladimir Putin for the 298 deaths – in place for as long as possible. Kerry told Thomas Schansman that he and the other families of victims should expect a long wait before the perpetrators are brought to justice. But the “everything” doesn’t apparently include releasing the data that Kerry claimed to have just days after the crash. Yet where the missile launch occurred has remained a point of mystery to the Dutch-led investigation. Last October, the Dutch Safety Board put the missile launch in a 320-square-kilometer area. Almaz-Antey, the Russian arms manufacturer of the Buk systems, conducted its own experiments to determine the likely firing location and placed it in a much smaller area near the village of Zaroshchenskoye, about 20 kilometers west of the DSB’s zone and in an area under Ukrainian government control. Earlier this month, Fred Westerbeke, the head of the Dutch-led Joint Investigation Team, told the families of the victims that the inquiry had yet to pin down the missile launch site, saying “In the second half of the year we expect exact results.” In other words, on the second anniversary of the shoot-down, the investigators looking into the MH-17 shoot-down still might not know what Kerry claimed to know three days afterwards. Investigative reporter Robert Parry broke many of the Iran-Contra stories for The Associated Press and Newsweek in the 1980s. You can buy his latest book, America’s Stolen Narrative, either in print here or as an e-book (from Amazon and barnesandnoble.com.